One of my favorite things to do in the new year is get organized and start on the right track! 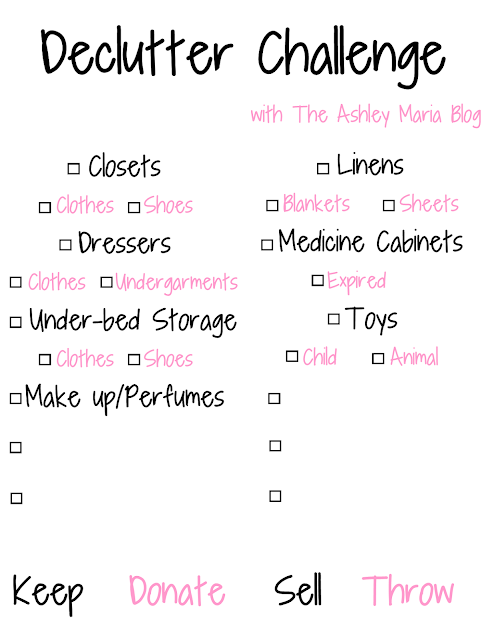 Today I came up with a de-cluttering challenge worksheet to help you as well! I like to think I keep up with me kitchen so I didn't include this on the list, however I did leave open spaces for you to fill in other parts of your home you want to de-clutter as well! Start by taking everything out of your closets, drawers, storage etc. Make these four piles. Donate: An item that was gently used, but could be useful to someone else. Sell: An item that may still be in packaging or have tags still on. Maybe you wore a dress once to a wedding and is still in really good condition. I use Poshmark, Mercari, and Facebook Marketplace to sell items! Throw: Item has holes, stains, damaged or has seen better days! Looking for more organization tips?